Signs of Buffalo rents the highest quality 4’ x 8’ black signs in Buffalo, NY and it’s surrounding suburbs. Our signs and lettering are higher quality and hold more text than our competition. Simply put, our signs are better !!!! Click here to See Why We’re Better. These 4’ x 8’ portable signs are perfect for advertising your sale or promoting your event or fundraiser. Signs of Buffalo will deliver, setup, letter, take down, and remove the sign. All you do is tell us your message and we’ll do the rest. 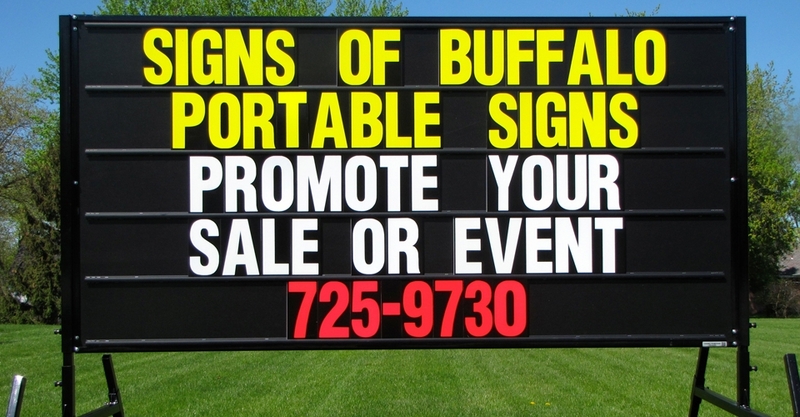 Signs of Buffalo is your ideal choice for sign rentals throughout Western New York. We service all of Buffalo, Grand Island, Amherst, Clarence, Tonawanda, Cheektowaga, Depew, Lancaster, Elma, Lackawanna, West Seneca, Orchard Park, Hamburg, and more. When using roadside signs, make sure to choose a sign that attracts attention (turns people’s heads), looks professional, and is clear and easy to read in a short amount of time. Signs of Buffalo’s black signs with fluorescent lettering will grab attention, look professional, and get your message to potential customers. These 4’ x 8’ portable signs are perfect for advertising your sale or promoting your event or fundraiser. Signs of Buffalo will deliver, setup, letter, take down, and remove the sign. All you have to do is tell us your message and we do the rest. For more information on portable, outdoor sign rentals in Western New York, contact us today, (716) 725-9730!